So, how was my very first Derby Practice as a skater, you ask? A whole lot of amazing things, is what it was. A lot like what The Birdchick and I went thru the first time hiving a package of bees. Very like the first time on My Little Pony, when I knew what riding could BE. Close to the feeling of playing music on stage with as powerful performer as AFP. Changes EVERYTHING. You're not the same person. Announcer Matt Black took some pics with his phone, knowing, as friends do, how much I would have wanted first practice pics, (had I been able to think clearly, which I couldn't), bless his heart, had no clue he was taking them till the end, but I get ahead of myself. There were things I expected, but more that I didn't. I didn't know about the shaking, getting my gear on. Sure, I was nervous in my HEAD, but I started shaking getting ready. Terror. Not in my head, but my body. Not even on the track yet. This, I was assured, was normal. And that assurance was the coolest thing, the other skaters, telling me not to worry, it would stop when I started skating. They'd all been there, and they knew. In fact, the whole night was like that, nothing but love, support and encouragement from all of them. No hand holding mind you, just a sense of, we know this is REALLY hard, but you can, you ARE doing this. And we're with you. I got to participate in the first drill. One where you have groups of three blockers skating and the jammers try and get thru, all together, divided around the track. Let me stop for a moment too and say this: Derby is a Sport. And there are rules. It's not a free for all fight. No one was going to come up and hit me out of the way, they knew I'd been skating for about 5 min. Hearing a lot of "Did you hit someone, did they punch you" That's not what it's about. It's skills, speed, endurance and strategy. Like any sport. The WFTDA Rule book is 42 pages long and it lays out how, where and when and what you can do. Sure, skaters can get hurt, it happens. But it can happen in ANY sport. My Little Pony spooks, or takes it into his head to act up, I may go off. The two times I've been hurt in the last few years, a concussion and broken arm, happened in my BEDROOM. Alone. One thing I want to do, talking about Derby to you, is to make very clear: It is a sport, like any other. And perhaps dispel some of the rumours. Any way, my job in my group of three was to keep up and hold the inside line and not let any jammers get thru. Keeping up was HARD. I have no skating muscles yet. All that time in the gym? Nope. I was dying halfway thru. But everything I've read and heard, by new skaters, giving advice, said to keep going, as long as you can, do MORE than you think you can, drop out if you have to, and get BACK. There's a point when you legs turn to noodles, you're soaked with sweat, you have no endurance and you realize you've been skating for about 10 minutes. Uh-huh. Long way to go. I kept up as best I could, and did have to Wall, (my personal term for dropping out and going to the Wall) But it wasn't LONG before the drill was over. 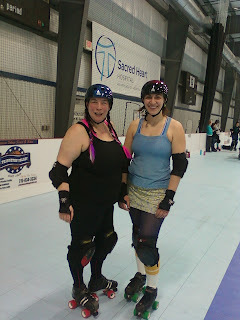 The next bit was scrimmaging, the other skaters playing against each other, which wasn't something I could do, so I went to the end of the track and learned and practiced skills, with skaters who weren't scrimmaging either. Learned so much, from the other skaters, who spent the next hour teaching me, going over things, working with me. That's Derby right there. Helping, teaching supporting, working and love. Then, at the end of practice, at the end of two hours, after all the drills, the scrimmage, the sprints, they did the 25 in 5. 25 times around the track in 5 minutes, which you need to be able to do. I didn't, couldn't have. Could only stand there and watch. Nothing I can say can explain the kind of muscle, will, and gods, what's a word? Sheer determination that you'd need to DO that. At the END of a two hour intense skate. I love them. I love this sport. Here's a last picture from Matt, which is pretty silly. That's me trying to smile. It looks like I'm dying, doesn't it? I am. Uh-huh. Hurts. Lots. Muscles scream you know. I'm falling over and loving every minute. There's nothing like it. I want to do this. I want to skate the whole time and do 25 in 5 at the end of two hours, too. And I will. Derby Practice Tomorrow. With Skates. Uh-huh. My Insurance came thru and tomorrow...And, well, I can skate. 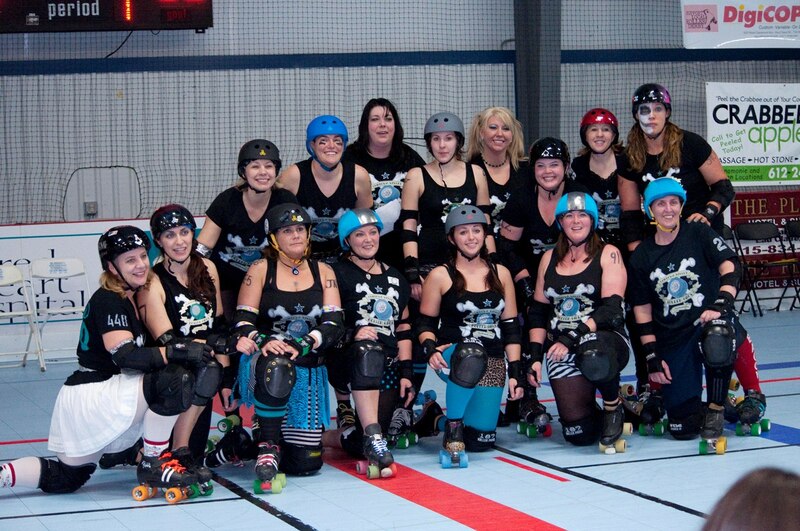 That's my team, the Chippewa Valley Roller Girls. I don't know all of them too very well, or anyone of them as well as I know other Derby Girls, but so far I can say they are as cool as everyone I've met so far, and they've been great to me. And they can SKATE. Because Derby is like that. But I haven't skated yet. Except in my dinning room. And open skates. And that is not, I suspect, at all the same sort of thing. Fresh Meat. That's what new girls are known as in Derby. I know I want this, very badly, and I know I will love this, but I also know I am really freaky nervous about it. It's hard being so new, being on the bottom, knowing nothing, with everything to learn. Every derby girl is knocking in her knee pads the first time she practices with her team. Then again the first time she practices with a better team than hers. 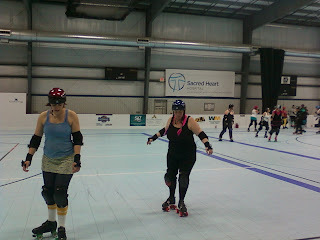 Also first workshop, first time on the jammer line, etc. There will always be something in derby that makes you scared and nervous. But there will be many more times you will have a confident smirk on your face and the knowledge that you CAN DO THIS! I liked that. And she's right. I was scared the first time I went to the gym, and the day I asked Poetry to teach me dressage, and the first time getting up on My (er) Little Pony, and when I asked Little Evil to train me, and, oh my yes, the first time I got Covered in Bees installing a hive. If you've known me a long time you will remember the Flash Girls 3rd gig. (MY first gigs too, actually.) The first two were coffee houses, the 3rd was opening for Warren Zevon, sold out show. Someone told me I looked so calm, and I said that I was holding onto the pole so I didn't fall over and all I could think was "Don't throw up, please, don't throw up"
I can't imagine now, or even barely remember, what it was like to be nervous about being on stage playing music. Hello? As Betsy Stemple always says "A Little Trial By Fire Never Hurt Anyone"
She's right. Yeah, I'm nervous. That's how it begins. Scared. But I'm going to skate. And start at the bottom, and work, and sweat and scream and learn. And get really freaky good at this. And Bout. And Win. It's love and trust and work. Like riding. Or music. Or Bees. If you asked me Why Derby? I don't think I would have an answer. 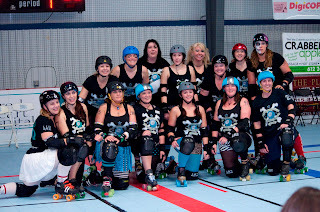 Lots of reasons, the women who skate Derby, and the sport, getting FIT, but that's not it. It's that something else inside you that screams "YEAH, I CAN DO THIS!" no matter what you actually think, feel or believe. Getting FIT blog time again. I need to tell myself some things, and get them straight in my head and since I said at the beginning I was going to take you with me on this, here it is. Getting FIT again, after having got fat is NOT EASY. That may seem obvious, but it needs to be stated. And it takes a long time. There is no miracle. Weight loss is a slow process. And muscle takes time to build. It takes sweat, pain and will. Like iron in your body and soul. It's not enough to want it really badly. You have to be willing to kill for it, because that is what is going to need to happen. Going to the gym is not ever going to get easier. There will never be a point where you leave a workout thinking "well, that was easy, got it now" Or there should never be. If you aren't dying, shaking and crying afterwords, why bother? At least for me, I want the weight loss but more I want muscle, strength and speed. Posting these pictures isn't easy either. I can't see the progress, at all. All I can see is how far there is to go. I can't imagine that 6 months ago I weighed 35 pounds MORE than this. That is the biggest thing I want to try and work on is saying to myself "Hey, Girl, you're doing good" Not easy. I don't know that I will ever think I'm good enough. I want more. Anyway, I'm not doing it alone. Here's a rare picture, the only one in fact, of Little Evil. My trainer. She's actually not evil, but very sweet which is why I named her Little Evil. Go figure. If you ever find someone like her, do whatever it takes to train with her. A great trainer will push you far farther than you can ever go on your own. I'd quit, I would never have attempted most of the things she seems to think I can do. And oh, I do 'em. Having someone believe in you is important. I'm lucky. I've got her, and Poetry, and Joan of Dark, all my Derby Friends, and I have you. Not something you can do alone. It's hard getting FIT, (yes, I did say that before) and I'm not whining, I don't mind the work, but it's the mental game that can beat you. The temptation to say, over and over "I'm sucking, I'm sucking, I'm still fat, I can't see ANY improvement and I've been at this 6 months" The progress is so subtle and so slow, you can't SEE it day to day. You still feel, well, not GOOD ENOUGH YET. I don't know when that GOOD ENOUGH feeling starts yet. That's a freaking 50 pound bar you're holding ever your head while doing lunges across the room. 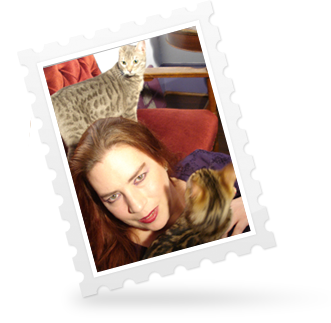 I wanted to write a new Blog, as it's been too long, but have been having trouble thinking of ANYTHING to write about. It's the end of winter. It's the hardest part, I think. It's the time when one ought to be taking off for Bora Bora. (May decide to do that yet..) Everything seems really hard, and bed seems like the easiest place to be. (Especially at THAT time of the month) You do your work, but it ain't easy. Lot of dark thoughts sometimes. They go away tho. I thought, all I need is one great idea. See that first picture? THERE'S a great idea. I have a friend coming to visit next weekend with Joan of Dark. (Actually there's a lot of them coming, THAT will be a blog) This friend loves the trampoline, but objects to the RULE. There's only the one: No Shoes On The Trampoline. I finally told her, fine, as long as that's ALL you are wearing. I forgot how connected to Derby this women is. Going to be some fun. Noooo. I don't think there will be pictures, of THIS great idea. Use your imagination. We're getting a LOT more snow this week. Speaking of snow, these are Snow Drops. They call them that because these little go getters are up LONG before the snow is gone. "HEY", they think "Above zero, we had a warm day, let's GO!" Let's have a Dog Update, while we're at it. Cabal, as you know has been pretty poorly this year, with four different surgeries, and was to the point where he needed a both a ramp and help, to get in and out. I am very glad to tell you, he's doing REALLY well! He's off ALL his meds, he's going for long walks, playing with Lola, and happy again. He smiles again. What we think he has was a sort of Degenerative Myleopathy. The Boss found a hospital in Florida who have had a LOT of success treating this, and while I would have been happy to nip down there with Cabal (It's no Bora Bora, but hey...)We didn't need to. It's based mostly on diet and exercise. Apparently, if he eats really well, and works out, he will get much better. WOW. There are also meds he can go on if he gets worse, but so far, switching to the SUPER Healthy, all natural food, with lots of Vitamin and Herb supplements (yeah, it looks pretty weird, Merry Housekeeper makes it up) has worked wonders. And because I do live with five Bengals, we will end with Madame Mim, looking nearly posed on her real faux fur blankie.